Future Stars tennis programs are designed for competitive and recreational players alike. 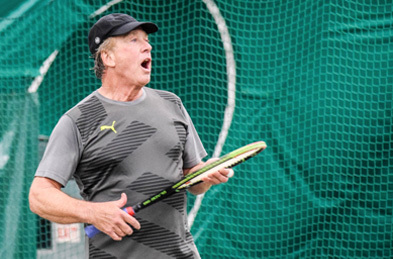 Future Stars offers programs such as adult clinics, women’s and men’s singles/doubles leagues, and more. Future Stars offers a multi-court clinic experience with a 4:1 player to pro ratio. Our expert staff will lead sessions that will challenge you and improve your game. Beginner classes will cover all the basics: grip, stance, swing mechanics, rules, positioning and intro to singles and doubles. Intermediate classes will focus more on spin subtleties, power, advanced footwork and mechanics, ball placement, strategic initiatives for both singles and doubles. Advanced classes will emphasize competition strategy, pace, ending points, fitness, pressuring opponents, and match play. Monday & Wednesday (Intermediate & Advanced): 9:30 a.m. – 11:00 a.m.
Friday (Beginner): 9:30 a.m. – 11:00 a.m.
Wednesday, 6:30 p.m. – 8:00 p.m.
Monday, 6:30 p.m. – 8:00 p.m. The men’s doubles league is a fun way to stay competitive and keep active. It starts at a 4.0 level. Please contact the office or league director with any questions about level. Tuesday, 7:00 p.m. to 8:30 p.m. The men’s doubles league is a fun way to stay competitive and keep active. It starts at a 4.0 level. The league director will set up the matches each week. Once the matches are set, players will coordinate the best time to play and call or email the club to schedule the match. Matches should be on weekdays, only. Please contact the office or league director with any questions. We’re excited to start our inaugural women’s singles league! It starts at a 4.0 level. The league director will set up the matches each week. Once the matches are set, players will coordinate the best time to play and call or email the club to schedule the match. Matches should be on weekdays, only. Please contact the office or league director with any questions.